The Hitachi Cordless Brad Nailer features a rear exhaust, aluminum housing and sequential trigger mechanism. This product includes (2) 3.6-volt rechargeable batteries, a power adapter, carrying case, safety glasses, no-mar tip and 4-millimeter and 3-millimeter hex bar wrenches. The magazine holds 100-fasteners and is perfect for large projects. Use this nailer with 5/8-inch to 2-inch nails. This 10.7 pound nailer is built tough and features an elastomer handle for added grip. 18V ONE+ AirStrike 18-Gauge Cordless Brad Nailer (Tool-Only) The 18V ONE+ System introduces the next generation in cordless convenience. This 18 gauge brad nailer features AirStrike Technology, which eliminates the need for noisy compressors, bulky hoses or expensive gas cartridges. This means faster setup and easier maneuvering on the job site. Tackle virtually any trim job with the capacity to drive up to 1,700 nails per charge using P108 4Ah High Capacity LITHIUM+ battery (sold separately).The 18V ONE+ 18GA Cordless Brad Nailer is sold as a bare tool, allowing you to build on your ONE+ collection without spending additional money on batteries and chargers with each tool purchase. 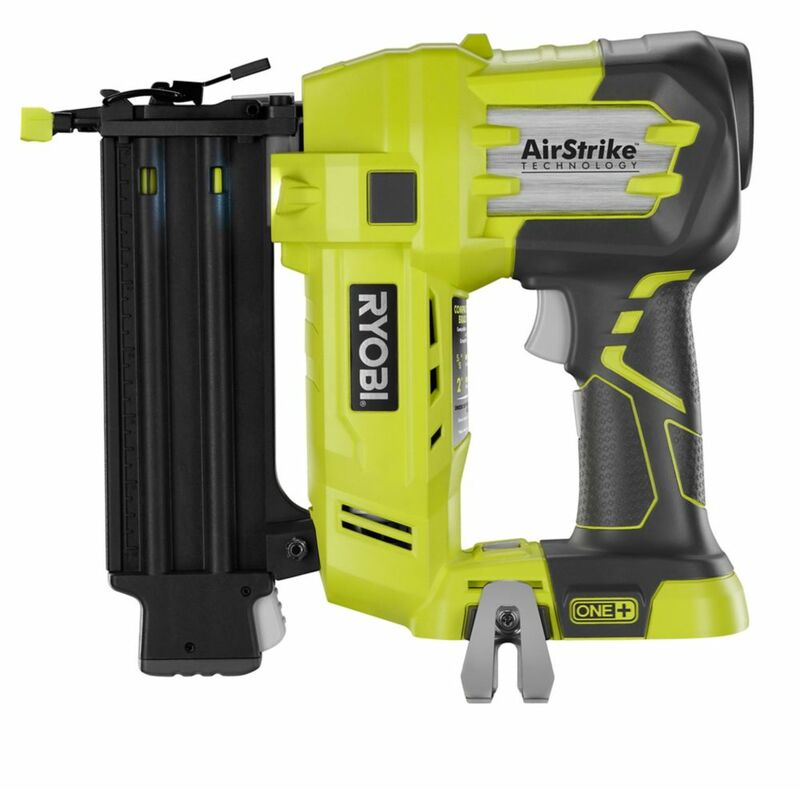 Best of all, like every RYOBI 18V ONE+ blue or green tool, this AirStrike Brad Nailer works with any 18V ONE+ battery. 18V ONE+ AirStrike 18-Gauge Cordless Brad Nailer (Tool-Only) is rated 4.6 out of 5 by 2311. Rated 5 out of 5 by Genoak from Love it!!! I use it everyday for my window institution.... Love it!!! I use it everyday for my window institution. This is my 3rd one. Money well spent ! Rated 5 out of 5 by HomeDepotCustomer from Hadn't used it much, but so far it seems ti... Hadn't used it much, but so far it seems ti be very good. Rated 5 out of 5 by Rod from works perfect for the light application that I am using it for. works perfect for the light application that I am using it for. Can I use this brad nailer for 18 GA staples as well? HI BigT, No, you can't use staples. In the description of this nailer it states that it can use nails ranging from 5/8 to 2 inches, but then in the specs is says max fastener length is 1 inch. Which is correct? that threw me off too, but the gun does take brad nails up to 2&quot;. If I want to nail the quarter round (base board), can I use this tool? What kind (size) of nail should I use if I use this tool? Hi Kit Man, You would need to use 1.5- or 2-inch finish nails. Can I use this for framing? Hi, I'm planning on renovating my basement. Can this tool be used for framing the 2X4 (installing studs)? Please advise. Thanks in advance. For framing , this 18 ga wont do, its intended for finishing around doors/windows and base board regarding basement . you ll need a frame nailer. Why did the nailer go up in price? Should have bought it on sale for 129! Regular was 149 I believe. Are there new features?